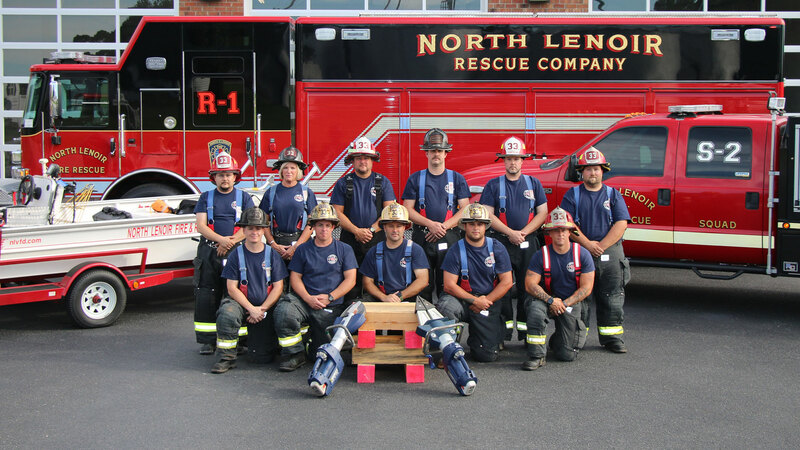 North Lenoir Fire & Rescue recently received several advanced rescue certifications from the North Carolina Association of Rescue and EMS (NCAREMS). The department and its members have invested in significant equipment upgrades and thousands of hours of advanced training and planning to obtain these credentials, making it one of the only departments in the region to offer these advanced rescue services. The NCAREMS certified North Lenoir Fire & Rescue as a Heavy Rescue, High Angle Rescue and Surface Water Rescue provider. NLFR is now one of only three Heavy Rescue certified departments and one of only two High Angle Rescue certified departments in the region. In addition to the new certifications, the department has also formed a Rescue Team comprised of members trained in various technical rescue disciplines. “The members of this team have obtained credentials in advanced technical rescue training and committed to continually working to hone their skills,” said Rescue Team Commander and Captain Brandon Ward. The department now has its eyes on obtaining certification in Agricultural Rescue, which provides additional training to deal with farming equipment and heavy machinery, and Wilderness Rescue. NLFR hopes to complete the required training for these certifications by the end of the year.